The Gospel according to St. Mark tells us that when Jesus returned to Capernaum, it became known that He was home. This is very interesting because Jesus is not from Capernaum - He's from Nazareth. Peter is from Capernaum. 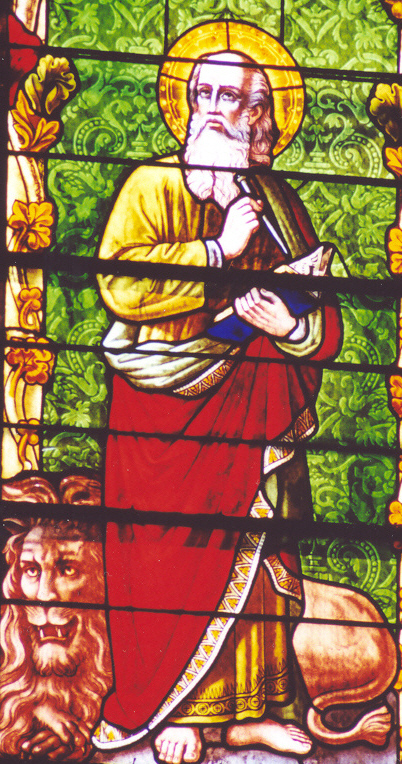 By this detail, St. Mark, who was St. Peter's secretary after Jesus ascended to heaven, is telling his audience that Jesus had begun identifying Peter's home as His home. This means that for Jesus, it was more important for Him to identify home as the place where His mission was taking root and less on where he really grew up. As we like to say, "home is where the heart is." Jesus does not confine Himself to what is familiar but rather - He extends Himself beyond mere human convention. Then, we have the paralytic. As historically accurate as this story is, the paralytic is also a metaphor for the individual who is paralyzed by sin. The paralytic is that person who has now gotten to the point where they can't even help themselves by God's grace, to seek His forgiveness in the Sacrament of Penance and needs the assistance of friends and loved ones to break out of the cycle of sin, despair and pain that keeps him separated from God. The paralytic is also a metaphor for that person who suffers from a serious illness or terminal disease and cannot help themselves. They need assistance to receive the Sacrament of the anointing of the Sick and help in old age or in their difficult condition. The persons who sometimes go unnoticed but should cast an impression of us are the friends of the paralytic - the ones who bore a hole in Peter's roof. They overcome their fear of being ridiculed and break social convention to help their friend. Like our Lord who reaches out beyond the confines of what is safe and familiar, they too risk ridicule with a sense of great tenacity, determination and almost reckless abandon just to help their friend who is so sick and cannot help himself. St. Augustine was famous for saying that each of us has the mandate and the vocation by our baptism to go out and seek out the paralytics in our midst who need our help and to abandon love for human respect in order to bring them to the feet of Jesus, especially in the Sacrament of Penance. We have to lower our friends through the roof of fear and ridicule to help those who cannot help themselves. We can do this by encouraging others to come to the Sacrament of Penance, by helping to catechize those who do not know their Catholic faith by agreeing to read the Catechism together and study. We can participate in this parish's small communities of faith program to learn more about our Lord through the Scriptures. Finally, we can frequent the Sacrament of Penance as a family or as a couple or as an individual every two months as a way of developing this habit of seeking our lord's forgiveness sacramentally. Be not afraid! These were the first words that John Paul II announced to the world when he was introduced as the 263rd successor of St. Peter in 1978. We live in very fearful times. I don't know about you, but I never thought I would see the day in this country when we would feel such a sense of deep physical threat to our way of life. In the last two weeks, we've seen the mad rushes of people to Home Depot to get the duct tape and plastic, which experts tell us will only offer a very paltry protection against weapons of mass destruction. For many, it's almost as if the plastic and the duct tape offer a sense of "security." Does it? Do we trust more in plastic and duct tape then in the power of prayer? There's nothing wrong with trying to provide ourselves with some sense of protection but what we must examine is if we can truly say, "In God we trust" or do we only find our security in other things? Similarly, so many people desire us to avoid war but how many of us are really praying for this intention? With this overwhelming desire for world peace, I would expect to see many more people at daily Mass or in prayer in the chapel. That has not been the case here. Are more families actually praying the rosary for world peace? We do well to assess how earnestly we want peace, if we are not willing to make sacrifices to pray and mortify ourselves for this end. St. Thomas Aquinas tells us that fear is a passion of the soul. It causes an individual to shrink from an impending evil and to turn inward. Fear is overcome by courage and daring - not just a surge of valor but an enduring courage. while fear in and of itself is amoral, we cannot allow fear to paralyze us. Yes, I like many of you are perhaps fearful of the physical and emotional pain that may result from another terrorist act, but we have to have our sights on heaven. If we make frequent Confession and remain in the state of grace, we really don't have anything to fear. We should be ready to go home to God at any time for our true homeland is in heaven and our true security is with the Lord. This was the courage of the martyrs - an overwhelming trust and confidence in Providence - that God cares for us; that He loves us; and that He will not abandon His beloved; and what awaits us is more than anything we could ever imagine in this world. Trying to preserve our lives in such a way that turns our attention to what WE can do to save ourselves can almost be a sign of a lack of hope and trust that God is watching out for us and that it is HE WHO SAVES US. In this time of tension in our city and in our country, we are not alone. We have the Lord. Finally in our Gospel, we have the scribes who cannot believe that our Lord would commit a blasphemy by telling the paralytic that His sins were forgiven. After all, only God could forgive sins. In the ancient Jewish understanding, if you had a disease or an illness, it was because you were a sinner. The more serious the illness, the more serious the sin you had committed. So, when Jesus heals the paralytic, He is also claiming to be able to forgive sins. In our Gospel today, Jesus gets beyond the mere physical paralysis and seeks to heal the paralytic on a much deeper level - in his soul. If he can heal the soul by forgiving sins, He must be God. In the Gospel, look again - Jesus does both - He heals the body and this means for the Jews that He can also heal the soul. They must conclude then that He is God. The scribes are also fearful - fearful that God became man is beyond their expectations of who God is and that He actually takes on our human nature in order to redeem it back to the Father. This healing of sins is exactly what the prophet Isaiah describes in our first reading. Isaiah says that the Israelites have burdened God with their sins and have wearied Him with their crimes and YET - God, wipes them away and remembers the sins no more. 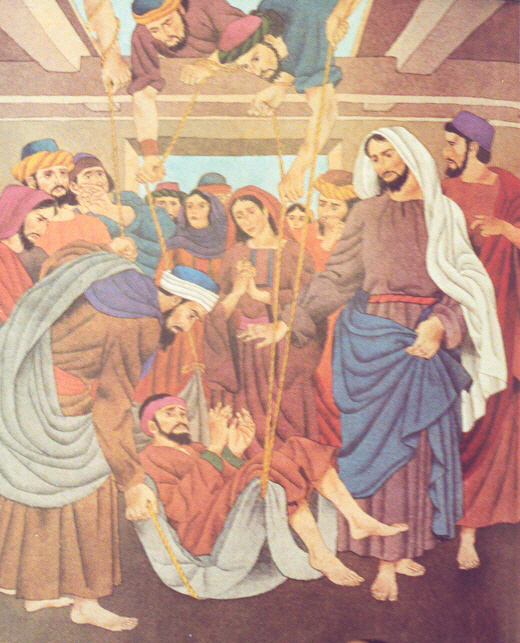 Just as the friends of the paralytic lowered him down in front of Jesus, mindful of their friend's need for forgiveness, may each of us approach the Sacrament of Penance and encourage others to do the same with the humility of the Psalmist who exclaims, "Lord, heal my soul, for I have sinned against you." May we learn to dispel the fear that keeps us from really trusting God with the virtue of hope. And may we always echo the ancient prayer of the Church found in the Te Deum: "In you, O Lord, is our hope, and we shall never hope in vain."